As summer heats up, sipping a chilled beverage becomes more appealing. Thus, drink trends are never more important than in the summer months. While last year, slowed-down craft cocktails, frozen rosé (a.k.a. “frozé”), and DIY cold bulletproof coffee were all the rage, this year’s summer drink trends turn a little greener. Functional drinks and cold brews are the two best ways to sum up 2018 beverage trends in the United States. Functional beverages are “non-alcoholic drinks that keeps one’s body hydrated and provide overall nutritional well-being. These are fortified drinks that prevent or help address health issues across all age groups” (Future Market Insights). Probiotics and the innovation continuing in “gut health” has pushed brands to take a new approach to wellness through beverage consumption, sparking what looks like a “prebiotic” movement coming onto the scene in late 2018, early 2019. Also, many drinks on the rise make use of spices thought to be detoxifying, like cinnamon, turmeric, and ginger. As consumers become more and more invested in the idea of food origins, understanding how to articulate to consumers where food comes from will become more important to marketers, as well. You can see this already happening with brands that are willing to even put the origin into the product name, like “Drink Maple.” This strategy seeks to form the bond, with the origin of the product immediately in their brand narrative. People seeking healthier alternatives via whole foods will be able to find these in increasing numbers through their neighborhood grocery, all the way up to services like Jet.com and Shipt. These services are competing to bring consumers their favorite brands directly to their front porch, as well as take advantage of Amazon’s limitations in cities that are not big enough to benefit from the Amazon/Whole Foods acquisition. If you have a product that is produced locally, and, say, stocked at Target (which is pretty common these days), it can be delivered to your home in minutes. This helps make lesser-known or niche beverage products, even local brands—like in our next trend, cold brew—easier to come by. Coffee has long been king since the mainstream rise of Starbucks. While cold brew coffee is not a new thing, it usually plays second fiddle to its cousin “iced tea,” which is popular in the northeast, and “sweet tea” in the south. The rise of cold brew coffee is tapping into consumer demand for variety, as well as experimental variety. This shows with the rise of products such as blends that are regionally specific, to kegged coffee and nitro technology, to brew-in-a-box technology that allows consumers to buy a “satchel” of coffee and cold brew it at home—much like grandma’s beloved, tried-and-true porch tea you probably remember from your childhood, sitting in the sun seeping all summer long. Whatever your favored summer beverage may be, you can find easy drinking summer solace close by. And to that, we say: Cheers! How can we help your beverage business create your very own trendy drink? We distribute a variety of food and beverage ingredients you can review here on our website, or via our product line card. Need to make an inquiry or place an order? Call us at 616-772-9100, or send an email anytime. 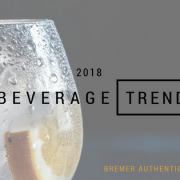 Another year approaches the end of the first quarter, and the beverage industry is showing several interesting trends we are seeing. Particularly of note is the shifting consumer base of health drinks. Health drinks include sports drinks like Gatorade and Powerade as well as protein drinks and other beverages that are typically marketed to athletes or people who are looking for something to complement or supplement their workout regimens. The industry is finding more and more people regularly consuming health drinks, even if those people are not working out before or during consumption of the beverages, which may even lead to a shift in the marketing target. Protein drinks in particular can have benefits to non-athletes. Vegetarians and vegans use protein beverages to supplement their diets, while some people simply use the drinks instead of eating an actual meal and elderly consumers might regularly consume these drinks to prevent muscle loss. Sports drinks are permeating markets beyond athletes, too, as people are stocking their refrigerators with their favorite brands and flavors. According to a January report from Mintel’s Bloom titled “Nutritional and Performance Drinks,” 61 percent of adults consume sports drinks. From an ingredient standpoint, it means food-grade chemicals are likewise increasing in popularity. Health drinks require high-quality ingredients like preservatives, coloring agents, food safe flavors, minerals and more. As we keep up with the industry trends, we make sure to have all the ingredients our customers need on hand. Also continuing to trend are ingredients for ever-growing wineries and distilleries that we work with in Michigan. Specifically, whiskey and sparkling wine have both grown significantly over the past year, with whiskey replacing vodka as the top-dollar producer among spirits. Like with health drinks, food-grade chemicals are essential to wineries and distilleries. Citric acid, tartaric acid, malic acid and others create unique flavor profiles and characteristics, with sugars and sweeteners also playing essential roles in wine and spirits. What other trends are you noticing as we progress into spring and summer? The beverage industry continues to fascinate and we continue to keep our warehouses stocked for everything our customers will need. Thinking of an ingredient that can enhance your beverages? Let us know how we can help. Have you ever toured a winery? If so, you’ve learned fascinating facts about how grapes are chosen, how they’re converted into wine, where distinct flavors originate and anything else you may have wondered (or never known to wonder) about wine. With the increase in wineries being established around Michigan, we’ve been graced with the opportunity to send our ingredients to wineries in Northern Michigan, Southwest Michigan and between. For our ingredients, it’s less of a tour and more of a fundamental, functional need, but it’s exciting nonetheless. Essentially, a winery ferments fruit, then blends and ages the juices. Depending on the specific properties of each individual wine (and whether or not the winery also bottles or stores its products), winemakers have very unique needs when it comes to authentic ingredients. That’s where it gets exciting for us. We’re seeing an increase in orders for granulated Michigan sugar and food-grade chemicals, as wineries need these ingredients to craft their products. Available on pallets and in bagged quantities, we’re able to serve big and small winemakers on an as-needed basis. Preservatives like citric acids, tartaric acids, sodium bicarbonate, potassium sorbate and others are needed for both the production and bottling of wines, keeping them fresh and adding flavor where applicable. In an industry as robust as winemaking, and with a product category that has such devoted followers, it’s nice to know our ingredients play a prominent role. We enjoy sending them off to wineries around Michigan and look forward to sampling the finish products. Are you a winery or craft wine maker looking for authentic ingredients? Let us know how we can help you. If you haven’t noticed, you haven’t been outside in a while. Craft breweries have been popping up all over the world, particularly here in Michigan. The microbrew craze is introducing many quality beers to the market, and consumers are indulging. But what about people who don’t like beer? Enter craft distilleries, which are gaining traction rapidly. Craft distillers are making their own whiskey, vodka, rum, gin and other liquors, and customers are loving it. Just as wine connoisseurs will travel nearly anywhere to sample good wine, new craft distilleries are counting on their premium liquors attracting the same type of audience that appreciates a quality drink. The same attributes that are making craft breweries so successful are also attracting customers to craft distilleries. Local, proud, passionate people are making extremely high quality products that can easily compete on a quality level with national and international brands. One of the ways commercial distilleries keep things authentic and local as they grow is sourcing their ingredients from reliable sources like Bremer Authentic Ingredients. Our warehouse is stocked with ingredients used by many a craft distillery. One in particular is molasses, specifically blackstrap molasses, due to the increasing demand from the more than 30 craft distilleries in Michigan (there were just a few as recently as 2009). The best liquors require the best sugars, syrups and byproducts (such as the afore-mentioned molasses), and that’s what we’re proud to deliver to our customers. If you have even a passing interest in authentic spirits, pay your local craft distillery a visit. We’re happy to play a small but important role in this booming industry.